Today is February 29th… Leap Day. What exactly is Leap Day anyway? 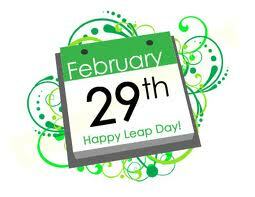 Leap Day is the extra day that is added every Leap Year to the shortest month, February. Why do we have Leap Day? Leap Day is added to the calendar because the Earth is a little slower than our calendar year. In truth it takes the Earth a little more than 365 days to travel around the sun. I can relate. I am almost always a little slow at getting things done too. The problem arises because our calendar is 365 days and if we ignore the extra time it doesn’t actually go away. I try this strategy in my life often, and I can assure you that when you ignore something it does not go away, in fact it usually gets worse. Get worse is exactly what would happen to our extra time problem if there was no Leap Day. Our calendars and seasons would be completely out of whack. Days would shift and over time seasons would start later and eventually we could be celebrating Christmas in July… or something like that. Can you imagine decorating the tree in the summer? Singing Christmas Carols poolside? I don’t think so. And what would we do with all our Christmas Sweaters??? In order to keep everything aligned a very long time ago the extra day was added, however Leap Year was not enough to keep the calendar in sync. In 1582 the calendar was behind 11 days. I am usually many days behind in everything so that might have worked out for me. However, I guess, it didn’t work for the people back then and the powers that be were not pleased. In order to fix the problem Pope Gregory XIII changed the calendar that year so it would skip 11 days. The calendar skipped from September 2nd to September 14th. Could you imagine that in today’s world? Think of all of the deadlines, meetings, and endless things we do everyday. Would it be possible to just skip 11 days? I don’t think so. And forget about if it was one of my kid’s birthdays! They would have had a fit! Apparently 1n 1528 you could lose 11 days on the calendar and it wasn’t a big deal. The modern calendar we use is called the Gregorian calendar to honor the Pope who straightened it all out. In addition, turn of the century years are only Leap Years if they are divisible by 4- Divisible probably haven’t heard that word since high school math class. Well that is it in a nutshell. Everything you never knew you wanted to learn about Leap Year. The question is what will you do with your extra day? I wish it really were an extra day but in reality it really is just another day filled with responsibilities and chores. However, maybe for a minute we should take a step back from our very busy lives and think of Leap Day as an extra day. It is after all an extra day that we didn’t have last year which makes it special. A day that we should take time out and appreciate our lives, and the special people we love who make it all worthwhile. I think Leap Day should be an extra day for appreciating all that is good in our lives. We can go back to griping about our fast-paced busy lives the other 365. This entry was posted in Life, Motherhood and tagged christmas in july, christmas sweaters, February 29th, Gregorian Calendar, Leap Day, Leap Year, Pope Gregory XIII, singing christmas carols, time problem, What is Leap Day, why is there Leap Year. Bookmark the permalink.